Facebook CEO debuts the Oculus Quest in San Jose, California. Facebook is launching another virtual reality headset that doesn't need a PC to work. This one might make serious gamers happy. 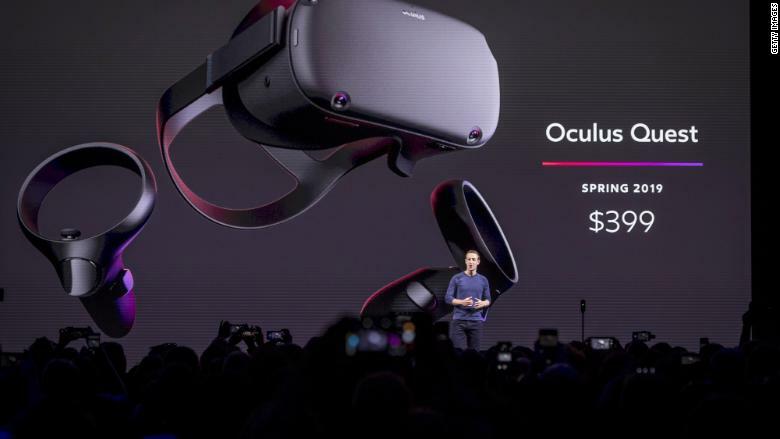 CEO Mark Zuckerberg unveiled the new hardware at the Oculus Connect conference in San Jose, California, on Wednesday. The latest VR headset from Oculus combines the mobility of its standalone, $199 Oculus Go with some of the power of its Oculus Rift, which must be tethered to a computer to work. The Quest has some improvements over the Go, including better position tracking through four wide-angle cameras. Facebook says users will be able to wander around in up to 4,000 square feet of space while using the headset. It comes with handheld motion controllers and will work with 50 existing Oculus applications when it ships. Facebook bought Oculus for $3 billion in 2014 with the belief that immersive virtual reality would be a place people could socialize in the future. The company previously launched Facebook Spaces, a virtual reality social network that lets cartoon versions of people interact in virtual locations.